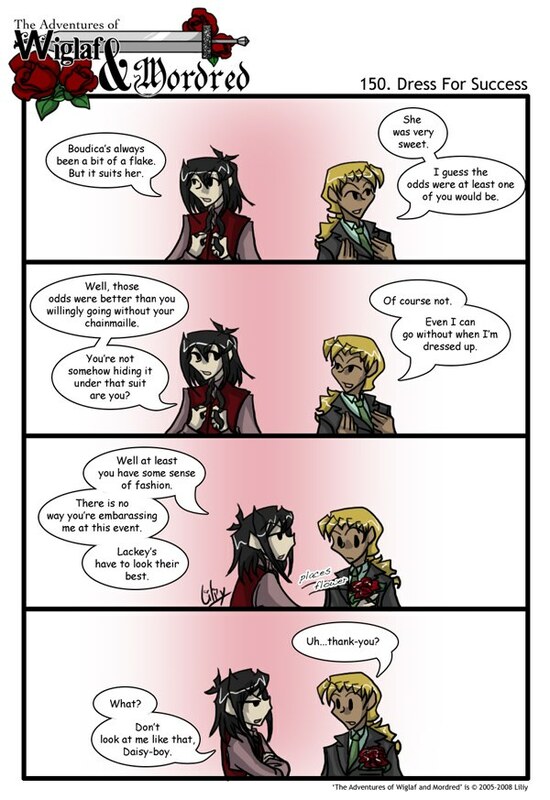 Mordred has a thing for plants. He can’t help it. Mordred has a thing for plants. That *clink* is too funny. Wiglaf will have to move pretty carefully around the theater if he wants to keep his chainmaille a secret. Yes, Mordred has a thing for plants. It must be an aesthetic taste for him. ^_^ I like the last panel where he folds his arms and looks cross. I agree new joke is better, ah Wiglaf and his chainmail. Everyone has their comfort blanket. Y’know, with all this talk about security blankets, you should start some sort of store selling blankets/throws with an image of Security on them. The ‘Lackey’s’ should be changed to ‘Lackeys’, no?